PAWNEE — Criminal investigators are in the preliminary stages of determining how medical waste was dumped illegally in the Arkansas River. The Pawnee County Sheriff’s Office began investigating the waste after fishermen near Ralston reported they had found used syringes and vials in the Arkansas River. Tuesday, cleanup crews found numerous biohazard sharps containers. The Oklahoma Department of Environmental Quality sent criminal investigators to collect evidence Tuesday, DEQ spokeswoman Erin Hatfield said. DEQ is a state agency responsible for regulating medical waste. However, Hatfield said it is not involved in medical waste transportation. Normally, medical waste goes to a facility in Stroud, she said. The waste is autoclaved and sent to a landfill. “What was found was not the proper way to dispose of it,” Hatfield said. Investigators found used hypodermic needles and vials which contained body fluids. 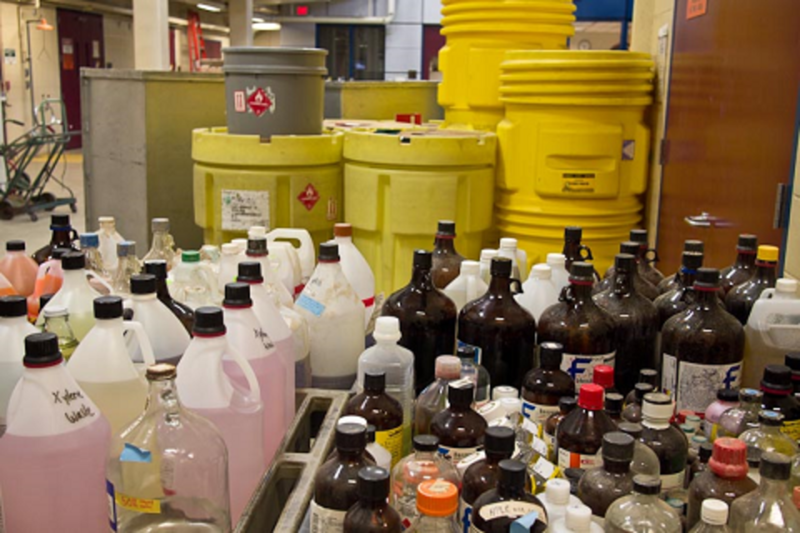 What is a RCRA hazardous waste in Maryland? In Maryland the Resource Conservation and Recovery Act (RCRA) governs the management of hazardous wastes. There is not a single comprehensive list of hazardous waste that is continuously updated, as hazardous waste identification is a process that involves many steps. To be considered a hazardous waste in Maryland, a material first must be classified as a solid waste (40 CFR §261.2). EPA defines solid waste as garbage, refuse, sludge, or other discarded material (including solids, semisolids, liquids, and contained gaseous materials). If a waste is considered solid waste, it must then be determined if it is hazardous waste (§262.11). Wastes are defined as hazardous by EPA if they are specifically named on one of four lists of hazardous wastes located in Subpart D of Part 261 (F, K, P, U) or if they exhibit one of four characteristics located in Subpart C of Part 261 (characteristic wastes). The F list - The F list designates as hazardous particular wastes from certain common industrial or manufacturing processes. Because the processes producing these wastes can occur in different sectors of industry, the F-listed wastes are known as wastes from non-specific sources. The F list is codified in the regulations at 40 CFR §261.31. The K list - The K list designates as hazardous particular wastestreams from certain specific industries. K-listed wastes are known as wastes from specific sources. The K list is found at 40 CFR §261.32. The P list and the U list (Discarded Commercial Chemical Products) - These two lists are similar in that both list pure or commercial grade formulations of certain specific unused chemicals as hazardous. Both the P list and U list are codified in 40 CFR §261.33. A P or U waste code may be applicable, provided that the material is an unused commercial chemical product (CCP). A CCP is a substance that consists of the commercially pure grade of the chemical, any technical grades of the chemical, and all formulations in which the chemical is the sole active ingredient (§261.33(d)). Even if the wastestream does not meet any of the four listings explained above, it may still be considered a hazardous waste if it exhibits a characteristic. In Part 261, Subpart C, EPA has designated the following four characteristics: ignitability (D001), corrosivity (D002), reactivity (D003) and toxicity (D004-D043). Ignitability - Ignitable wastes create fires under certain conditions or are spontaneously combustible, or have a flash point less than 60 °C (140 °F). The characteristic of ignitability is found at 40 CFR §261.21. Corrosivity - Corrosive wastes are acids or bases (pH less than or equal to 2 or greater than or equal to 12.5) that are capable of corroding metal containers, such as storage tanks, drums, and barrels. The characteristic of corrosivity is found at 40 CFR §261.22. Reactivity - Reactive wastes are unstable under "normal" conditions. They can cause explosions, toxic fumes, gases, or vapors when mixed with water. The characteristic of reactivity is found at 40 CFR §261.23. Toxicity - Toxic wastes are harmful or fatal when ingested or absorbed (e.g., containing mercury, lead, etc.). When toxic wastes are disposed of on land, contaminated liquid may drain (leach) from the waste and pollute ground water. Toxicity is defined through a laboratory procedure called the Toxicity Characteristic Leaching Procedure (TCLP). The toxicity characteristic is found at 40 CFR §261.24. Generators are responsible for characterizing their waste and hazardous and must determine whether a waste exhibits a characteristic by either testing or applying knowledge of the hazardous waste characteristic of the waste (§262.11). In addition to federal RCRA hazardous waste identification rules we have outlined, most states are authorized to operate their own hazardous waste programs and may have more stringent rules than those of the federal hazardous waste management program. For instance, a state may impose more stringent regulations for hazardous waste identification or identify state-specific hazardous wastes. Therefore, we suggest that you contact your state hazardous waste agency to determine which regulations are applicable to your situation. If wastes are not listed or do not exhibit any hazardous waste characteristics, they are considered nonhazardous solid waste (as opposed to hazardous wastes). Nonhazardous solid waste disposal and recycling is regulated on a state level. Therefore, you may wish to contact your state solid waste officials for more information on solid waste management. Medical waste, also known as clinical waste, refers to biological products, which are essentially useless. Medical Waste Disposal is an environmental concern, as many medical wastes are classified as infectious or bio-hazardous and can spread infectious disease. Medical Waste Disposal is the most fundamental and crucial step towards infection prevention in healthcare facilities. It is also the most neglected aspect of infection prevention. This article shall highlight the risks involved in improper handling of Medical Waste and explain the importance of proper Medical Waste Disposal techniques. At any healthcare facility all staff have an equal responsibility to dispose off Medical Waste in a manner that poses minimal hazard to other healthcare workers, clients, visitors and the community at large. Good housekeeping is the foundation of good infection prevention. Good housekeeping reduces microorganisms, reduces the risk of accidents, and provides an appealing work and service-delivery space. Anyone who handles contaminated waste--from the time it is thrown out by a service provider to even after it reaches the site of final disposal--is at risk of infection or injury. In many settings, housekeeping staff may not understand their risks. It is particularly important for supervisors to ensure that these staff know their risks and follow the appropriate procedures. The following people face a very high risk of suffering from infections if Medical Waste Disposal is not handled properly. Records show that US health-care workers suffer almost 400,000 needle-stick injuries every year that could expose them to blood borne viruses risking infection from transmittable diseases. If possible, all the staff at risk of sharp related injuries should be vaccinated against Hepatitis - B. Clients: Staff members who have not effectively carried out Medical Waste Disposal can easily transmit the infection to clients. Community: Improper Medical Waste Disposal is one of the greatest threats to members of the community. For example, contaminated Medical Waste can be found by children who are playing and cause them injury and infection. In many low-resource settings, scavenging of medical waste is a significant problem. Not only are scavengers at risk of injury and infection themselves, but this practice can also put clients and the local community at risk when scavenged waste, such as syringes and needles, is reused. By educating staff, administrators, and the local community about the dangers of contaminated Medical Waste and by instituting low-cost, safe Medical Waste Disposal practices, all health facilities can minimize the risks associated with waste disposal. Here is a great article for Maryland Dentist on proper sharps management and medical waste disposal. For the best prices and service contact us today for medical waste disposal in Maryland. Waste materials are routinely generated during the provision of oral healthcare. Most of this waste is nonhazardous and can be managed in the same way as household waste. However, some products used in dental practices can pose a risk to humans or the environment if discarded into landfills or poured down drains. These types of waste are regulated and must therefore be managed separately. Typically, two types of regulated waste are generated as a result of dental care: regulated medical waste and hazardous chemical waste. These two types of waste each necessitate their own procedures and have different requirements for labeling, storage, disposal, and recordkeeping. The US Environmental Protection Agency (EPA) regulates hazardous chemical waste. The standards set by the EPA are generally adminstered by a state or county agency. These relate to limitations on the amount of certain types of waste allowed to be discharged, the use of hazardous waste manifests, and storage, transport, and destruction of the waste. In some cases, a hazardous material may be completely prohibited from discharge to the sanitary sewer system, such as in the case with many chemicals. In other situations, a limited amount of a hazardous material may be discharged, such as with silver, mercury, and other heavy metals. Usually, these limits are set by either the state or local authorities. Unlike hazardous chemical waste, there are no federal standards for the management of medical waste. Instead, each state has separate requirements for how the waste is to be collected and disposed. In most cases, medical waste, including sharps, cannot be treated in the office by autoclave and must be disposed of by a licensed medical waste treatment facility. Many treatment facilities offer services that will collect the medical waste, and sharps can be mailed to the treatment facility. When mailing sharps, carefully follow the instructions for packaging and labeling. The company providing the mailback service must be approved by the US Postal Service, and clinicians must use the packaging material supplied by the disposal facility. Contaminated medical waste is generated as a product of healthcare services when disposable items such as gauze are contaminated with blood or other body fluids and when used sharp items such as needles and blades are discarded. The US Occupational Safety and Health Administration (OSHA) defines regulated medical waste in the Bloodborne Pathogens Standard. Regulated medical waste is liquid or semi-liquid blood or other potentially infectious materials (OPIMs), or items that would release the same if compressed. It also includes items that are caked with dried blood or OPIM that could be released during handling. Contaminated sharps and pathologic and microbiologic wastes that contain blood or OPIM are also regulated.1 All other waste, such as gloves, patient bibs, and disposable gauze that does not release blood, is not regulated but should be disposed and discarded in a manner that will not lead to accidental bare-handed contact by office or cleaning personnel. Contaminated disposable sharps (such as used needles) comprise the majority of regulated medical waste in dental practices.2 Proper storage and labeling of regulated medical waste is one of the many provisions of the Bloodborne Pathogens Rule. Among the requirements, sharps containers must be color-coded or labeled, closable, leakproof on the sides and bottom, and placed as close as feasible to the location where the sharps are in use. OSHA requires that sharps be discarded as soon as possible after use, meaning that in most cases, the sharps container should be in the treatment room so that used needles, blades, wires, and other disposable sharps are not left until the end of the appointment to be discarded. Sharps containers should be capped when the contents reach the fill line and then discarded according to local regulations. Some dental practices may perform procedures that result in waste products that are contaminated with blood or OPIM. If these items will release fluid blood or OPIM during handling (or dried blood that would flake), they must be discarded as regulated medical waste. Soft regulated medical waste, such as saturated gauze, cannot be placed in a sharps container but must be collected in a medical waste container that is leakproof on the sides and bottom, labeled, and closable. Often, a biohazard box lined with a red bag is used for this waste (Figure 2). These containers may be stored only for limited times in the office before they must be transported to a licensed facility for treatment. The storage time limits vary from state to state and may depend on the amount of regulated waste that an individual practice generates. Larger-quantity generators usually are allowed shorter storage time limits. Regulated hazardous waste includes products that are flammable, corrosive, toxic, or reactive, or pose some other risk to health or the environment. Hazardous waste can enter the environment either through solid waste sent to landfills or sanitary sewer systems when products are sent down the drain in the dental office. Hazardous material may enter the environment as a byproduct of dental procedures, such as when amalgam restorations are removed and high-speed suction lines carry the material to the wastewater stream. It may also enter the environment after use when disposing leftover or expired products that contain hazardous chemicals. Numerous products that are used in dentistry may be classified as hazardous waste. Some common materials or equipment that may be regulated in various locations include X-ray processing chemicals, acid etch, disinfectants, monomers, some adhesives, X-ray film, lead foil, disinfectants, and universal waste (eg, batteries, fluorescent light tubes, computers and computer monitors, mercury-containing thermometers). Specific limits on what can be discharged down the drain or discarded into landfill are developed by either the county or state regulatory agencies and vary widely throughout the United States. It may not always be immediately obvious that a product is a hazardous waste because the manufacturer of the product does not always provide information regarding disposal. It would be virtually impossible for manufacturers to provide information that is consistently accurate because the regulations vary greatly depending upon the location of the dental office and regulatory limits for various hazardous materials can frequently change. Often, state or component dental societies maintain some general information about hazardous waste regulations and may be a useful resource for offices trying to ensure compliance. Amalgam is probably the most well-known example of hazardous waste in the dental office. Because amalgam contains mercury, it is a regulated hazardous waste. In offices where amalgam restorations are removed, the fine particles that enter the waste stream through the high-speed evacuator are often too small to be captured in the dental unit trap. Unless other measures are taken, these small particles can become part of a sludge that makes its way to the municipal water treatment facility. Because municipalities lack the technology to remove mercury (or amalgam) from the waste water during treatment, the mercury may eventually be discharged to the rivers, lakes, and streams where it enters the food chain through fish and other aquatic life.4 Increasingly, state and regional authorities are requiring the use of amalgam separators to capture particles that are too small to be caught in the dental unit filter trap.5 In addition, the American Dental Association provides best management practices for handling amalgam with the intent of reducing amalgam to the waste stream. Managing hazardous waste takes time and money. Violations of hazardous waste laws can result in stiff fines and, in extreme cases, incarceration. One of the most effective and economical means of managing hazardous waste is through implementation of hazardous waste reduction strategies. Sometimes, substitution is the best approach. Substitution entails evaluating the hazardous materials that an office is using and determining whether a product of equal effectiveness without a hazardous characteristic is available. For example, if a practice is using a surface disinfectant that requires disposal as a hazardous waste, it is conceivable that an acceptable nonhazardous alternative can be found. It may also be possible to eliminate the use of some hazardous chemicals in the dental office. A switch to digital radiographs will eliminate the need to use and then discard X-ray processing chemicals. Some offices use high-level disinfectant/chemical sterilants. In many locations, these must be handled as a hazardous waste when discarded. The items being chemically disinfected can be evaluated to determine if either heat-stable or disposable alternatives are available. If the items are noncritical (ie, contact only intact skin), high-level disinfection is unnecessary and the item can be safely processed using a less hazardous low- to intermediate-level disinfectant. Inventory control can also reduce hazardous waste. Products with the shortest shelf life should be used first, and excess inventory beyond what will likely be used before expiration should not be ordered. Some products that are typically discarded as hazardous waste can be recycled. Dental amalgam, old crowns, and lead foil are examples of waste products that can be recycled rather than discarded. Most dental practices are likely to generate at least one type of regulated waste, whether it is contaminated sharps, chemical waste, or blood and tissue. It is important to understand that regulations regarding the handling, storage, and disposal of waste can vary a great deal from state to state. The local regulatory agency will be the best source of information regarding specific requirements in a given location. Written standard operating procedures based on local regulatory requirements will help everyone ensure and maintain compliance. It is also useful to have clearly defined responsibilities regarding who in the office is responsible for regulated waste management. 1. Occupational exposure to bloodborne pathogens; needlestick and other sharps injuries; final rule. Occupational Safety and Health Administration (OSHA), Department of Labor. Final rule; request for comment on the Information Collection (Paperwork) Requirements. Fed Regist. 2001;66(12):5318-5325. 2. Miller CH, Palenik CJ. Infection Control and Management of Hazardous Materials for the Dental Team. 4th ed. St. Louis, MI: Mosby Elsevier; 217-223. 3. National Institute for Occupational Safety and Health, US Department of Health and Human Services, Public Health Services, Centers for Disease Control and Prevention. Selecting, Evaluating, and Using Sharps Disposal Containers. Atlanta, GA: 1998. DHHS Publication No. 97-111. 4. Chin G, Chong J, Kluczewska A, Lau A, Gorjy S, Tennant M. The environmental effects of dental amalgam. Aus Dent J. 2000;45(4):246-249. 5. McManus KR, Fan PL. Purchasing, installing and operating dental amalgam separators: practical issues. J Am Dent Assoc. 2003;134(8):1054-1065. Why Should You Never Compact Medical Waste? Never compact medical waste! Maryland, Virginina, Washington DC and more, the rules are the same on medical waste packing instructions. In my 15 years of providing biohazard medical waste disposal, I have seen many interesting things. One question I receive often is, can we compact our medical waste? Well the answer to this is NO. In short, several reasons apply for Maryland medical waste disposal. Most medical waste disposal companies will use a corrugated cardboard medical waste box, or reusable tubs. For this discussion, we will use the medical waste cardboard box. Most providers will use an industry standard, 30 gallon cardboard box, with a 3 mil red biohazard bag or liner. Most boxes will be about 18 inches wide, the same deep and about 24 inches tall. These measurements will vary from provider to provider, but this will be the norm. Now most of these boxes will also have a weight limit, again the standard I have seen is about 45 pounds. This weight limit will come from different variables, box design, size of box, State regulations, etc. But, for argument sake, we will use 45 pounds. We recommend to our customers a 40 pound weight limit, giving the customer a little extra room, to go over. In my time of providing service medical waste disposal, I have seen people step on waste with their foot, use a broom, a box with weights to compress waste, I even had a customer with his own trash compactor that would compact waste sharps and needles. Then he would put the trash compactor bag, in the medical waste box. For many reasons, this is not SAFE. A person should never reach into a medical waste box, press on or step on medical waste. Also, medical waste boxes are usually handled by a driver or (Waste Technician) when the boxes reach weights over 45lbs, it is difficult for them to handle. Another problem is boxes coming apart, if the box is overweight, it may implode. This leads to a possible environmental issue and your driver being exposed to infectious medical waste. In this case, the medical waste box will need to be re-packed and your provider will probably issue you a re-packing fee, or overweight charge. Now, as far as treatment is concerned, again most disposal companies will use one of two standard treatment processes. Incineration or autoclave, for either one, this is where compaction really becomes a problem. For complete regulated medical waste incineration, whenever the medical waste is compacted, complete destruction by incineration may not be met. When this happens, the disposal facility will need to recycle recognizable waste through the entire process again. Costing time, money and more environmental exposure for having to do something twice. In steam sterilization, the same can happen, during treatment, the steam saturation, for complete sterilization, may not be met. Meaning the disposal facility may need to re-treat or the waste could be sent to a landfill without being properly treated. As with incineration, Costing time, money and more environmental exposure for having to do something twice. In either case, this is unacceptable, the biohazard waste treatment and disposal process, is a pennies business. Meaning, the margins are tight to begin with, most providers spend countless hours, refining the process to provide a compliant service, while saving the customer money, all the while trying to protect the environment. So, in the end, NEVER compact medical, biohazard or infectious waste in Maryland! Examples provided are just that, EXAMPLES. Regulations change from the federal government, also from State to State, in addition, your Biohazard Waste Disposal Company, may have their own special rules and regulations for packing and handling medical waste.